SPRING BREAK! This was something I was looking forward to, not so much because I would have a few days off to head to a crowded beach, but rather because my parents were coming to visit us in Texas! It had been five months since our last visit with them in Ohio so we were more than due for some time together. In the two years we've been on the road, I have fond memories of my time with my parents in Charleston, Bar Harbor, and now both Houston and Port Lavaca. We worked an extra day the week prior to their arrival and the other couple that works with us at the campground offered to work the afternoon shift for us on Sunday. Thanks Frances & Mike! That gave us a head start to meet my parents who had flown into Houston on Saturday. It was so good to get to hug my mom and dad. Phone conversations, text messages, and emails will never come close to replicating a good ol’ hug! We arrived at the hotel just in time for their free dinner & drinks menu. We sat around chatting about our experience so far here in Texas. Before long, it was bedtime and time to make plans for the next few days in Houston. Our only Houston area experiences thus far had been the Houston RV Show and a trip to and from the Houston airport. So, we were all in the same boat and ready to play the role of tourist in the area. Monday morning we met in the same place we left each other, the lobby of the hotel for breakfast. Our plan was to head to Galveston which both my parents and Russ and I had many people tell us we must visit. Not knowing exactly what to see and do in only one day, we stopped by the Galveston Island Visitor’s Center. The ladies working gave us some recommendations for our short visit and ideas for things to do on a return trip in the future. Her first recommendation was to walk around The Strand, Galveston's historic downtown district. It was several blocks to the main downtown area which offered a selection of shops, restaurants, galleries, and museums within a radius for our self-guided tour. It is in this area that we enjoyed beautiful historic buildings, many of which survived the 1900 Storm which is still regarded as the worst natural disaster in U.S. History. We walked through a spice & tea shop, a few boutiques, a confectionary, and a building labeled the Peanut Butter Warehouse. What a cruel joke that was to find out there was no peanut butter to be found in there. Oh the horror! Instead we found clothing, antiques, home furnishings, and art. The Peanut Butter Warehouse was built in 1895 and was used at one time to store candy and peanut butter. So I don’t often dream of going back in time, but if I did have to I would chose 1895 in Galveston. Even at that time, it was still operating as a marketplace with an assortment of gifts, but they did sell freshly ground peanut butter. If anyone is looking for a small business idea, the Peanut Butter Warehouse in Galveston NEEDS peanut butter. We walked out by the water where the Port of Galveston resides which connects the Galveston Bay to the Gulf of Mexico. It was standing there we realized how crazy this area would be when cruise ships started rolling in along with visitors seeking some beach therapy in the summer. As we saw the shrimp boats rolling by and the pelicans feeding, we decided it was lunch time for us too. We enjoyed lunch at the Greek restaurant, Olympia, with views of the harbor. After lunch, we headed back to the car taking a slightly different route to enjoy more of what the downtown district had to offer. From there, we decided to head toward the beachfront area of the island. We followed our senses including the winds, the sound of the surf, and the salty smell of the water and maybe a little bit of GPS too! 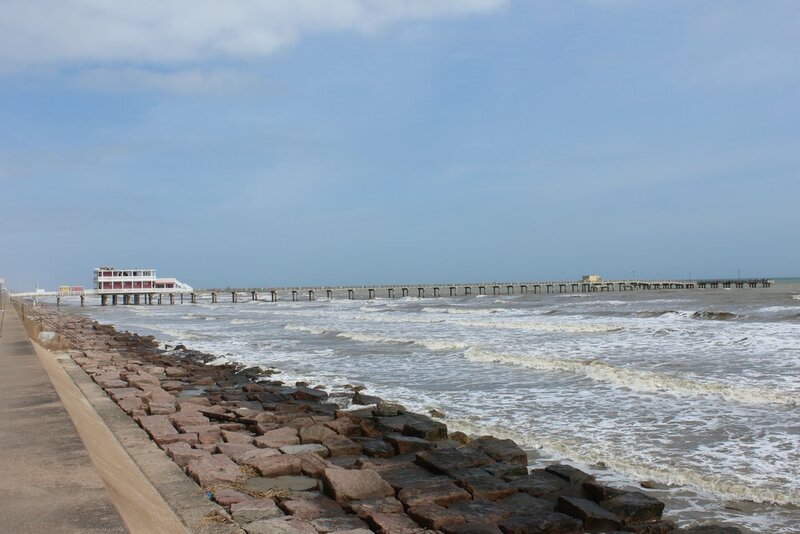 We landed in the center of Galveston’s beachfront area which is called Seawall Urban Park which stretches more than 10 miles offering plenty of beach access. The island’s famous Seawall Boulevard is where you will find the nation's longest continuous sidewalk, which will definitely be traveled by foot or bike during a future visit. In the hot summer months, this area provides a unique mix of beach access and beachfront restaurants, attractions, and entertainment. While the weather is mild, it certainly wasn’t beach weather so we enjoyed the seawall from the comfort of our vehicle. Russ provided the taxi service while my parents and I enjoyed the Gulf views. We continued along the Seawall to Stella Mare RV Resort which was one of the places we applied to work for the winter season. When we pulled into the campground, we were greeted by the manager of the park. What a nice guy! We chatted with him before exchanging business cards. The campground was extremely well-kept with all sites being concrete. It is right across the road from the beach! Having finished our walking tour in the historic district and getting our waterfront / beach experience in the afternoon, we had one more thing we wanted to enjoy before heading back toward Houston. The lady from the visitor’s center also gave us information on the Tree Sculpture Tour. The Galveston Tree Sculpture Tour is a self-guided tour that can be enjoyed by walking, biking, or driving. Again my parents & I chose to have our Taxi Driver Russ be the guide. To give you a little history of the tour, Hurricane Ike covered most of Galveston Island in a tidal surge in September 2008. This left many of the island's majestic oaks uprooted. While many saw the trees as destroyed, a group of homeowners decided to breath life into the remaining stumps by creating whimsical sculptures. All of the sculptures are on private property and were paid for by the private residents. The tour route took (with the handy dandy map from the visitor’s center) us past 21 tree sculptures and past hundreds of beautifully historic homes. Each sculpture unique and different, many telling a personal story of the homeowner. While it took less than a hour, this tour was like a BOGO free tour. It was two-fold in the main part being the cool tree sculptures and the other being a tour of some cool homes in Galveston’s East End Historic District neighborhood. While we didn’t come close to seeing or doing all there is to enjoy in Galveston, it gave us a good sampling of some of the highlights of the island. Tuesday’s plan was Space Center Houston. This was one of the things we had one our “Must Do While in Texas" list. It just so happens my dad is a science-junkie and my mom loves anything educational. What do you want to be when you grow up? “An Astronaut” said little Betsy years ago. Maybe I should have went that route as it appears I am still trying to figure it out. Elon Musk, take me to Mars! We arrived at the Johnson Space Center complex right at opening time. From our parking space, we could see Boeing’s Independence Plaza. This is where the shuttle replica, Independence is mounted on top of the original NASA shuttle carrier aircraft. It was massive and I was getting pretty excited for our day of exploring the Space Center. We purchased tickets and then walked into the main lobby a bit overwhelmed. I had read on several blogs, that it was recommended to start off with the tram tour first thing in the morning. So we beelined it to the tram tour launch point. Even though, we headed straight there the wait was already about 45 minutes. You see we weren’t the only ones that had the Space Center on their agenda on this Tuesday at the end of March. There was a large school group and it gave my mom and I flashbacks to being a teacher on an elementary school field trip! I still wonder if heading straight to the tram tour was the best bet because that is what everyone thinks they should do. Maybe exploring the attractions inside in the morning and an afternoon tram tour would have been the better option. There are two tram tours and we opted for the longer of the two which I believe was the blue tour. The red tour (30 minutes) only stops at the Astronaut Training Facility. The 90-minute tour includes a narrated drive through the campus of the Johnson Space Center, a stop at the Space Vehicle Mockup Facility, a visit to the Historic Mission Control, and Rocket Park. The Space Vehicle Mockup Facility is where astronauts train for current missions and where scientists and engineers are developing next generation space exploration vehicles. There were some super cool-looking things in this big building which is 8 stories tall and 2 football fields in length. It looked a little like a really cool science-themed playground with full-size mockups, including one for the International Space Station. The Iconic Christopher C. Kraft Mission Control is where NASA led both Gemini and Apollo Missions, including the momentous first lunar landing. All you non-moon landing conspiracy theorist, go ahead and skip to the next post. I’m not going to talk to you right now! It felt like I had walked onto the movie set of Apollo 13. The room was just like I’d imagined and the room hadn’t seen any renovations since. They are trying to keep everything or return everything to the way it was at the time of the launch. To give you perspective, the seats still had ash trays which the guide recommnded not sticking your finger in as they hadn’t been cleaned in years! It was in this room where they cheered as man stepped on the moon in Apollo 11, where they safely brought Apollo 13 back home, and sadly also the place they watched the Challenger explode. This may have been my favorite stop on the tram tour. It gave a sense of realness to all that happened at the Johnson Space Center. As a sidenote, this part of the tour also includes walking up six flights of stairs and you are reminded to not make a peep as space scientists (or whatever they are called) are still hard at work in this building. The final stop before our tram returned us to Space Center Houston, was Rocket Park. Rocket Park is the home of four rockets that were used in NASA missions during the ‘60s and ‘70s. Standing right beside the upright rockets, their size is overwhelming. However, the rockets outside are quickly dwarfed when walking into the giant climate controlled building that houses the Saturn V Rocket. It's size was astounding and a bit mind-blowing. The rocket is displayed on its side, but would stand at 30 stories tall. The Saturn V rocket is the tallest, heaviest, and most powerful rocket ever flown and is rather accomplished in that it carried many missions, including 27 astronauts into space. I’ve always been easily impressed, but to realize this 6.2 million pound rocket can launch into space will never cease to amaze me. I am always blown away that massive cruise ships can float and a Boeing 777 can fly as well. So maybe that doesn’t say much for my understanding of physics. The different segments or stages of the Saturn V were easily distinguishable and made it a little more clear of how exactly that rocket can achieve the feat of launching into space. I will never again complain about filling up The Big Tow’er with fuel after realizing the Saturn V gobbled up 40,000 pounds of fuel per second with 5 massive jet engines. When we returned to the Space Center, we fueled up with coffee and a light snack as we had promised ourselves a trip to Torchy’s Tacos. We spent time exploring the other attractions, including a longer stop in the Mission Mars section. We joked with my parents that they would have to plan a longer stay when they came to visit us in Mars next year during Spring Break! We finished our tour of Space Center Houston in Independence Plaza which is what we had seen from our parking spot. We were able to board both the shuttle and the aircraft. This is where the shuttle replica, Independence is mounted on top of the original NASA shuttle carrier aircraft. While real shuttles can be seen elsewhere, this is the only place you can see a spacecraft attached to an aircraft. Definitely an impressive feat of engineering to figure out how to transport from Edwards Air Force Base in California back to Kennedy Space Center in Florida. We spent about six hours at Space Center Houston and definitely didn’t see everything there, but we had a blast. See what I did there! I made a punny funny! Did you know the famous quote “Houston, We Have a Problem!” is erroneous? The words actually spoken by Apollo 13 astronaut Jack Swigert were “Okay, Houston, we’ve HAD a problem here.” After prompted to repeat, Mission Commander Jim Lovell responded “Uh, Houston, we’ve HAD a problem.” Don’t worry I won’t ruin another famous quotes from Johnson Space Center, but I will tell you the momentous “Houston, the Eagle has landed.” does omit part of Neil Armstrong’s actual quote of “Houston, Tranquility Base here. The Eagle has landed!” You learn something everyday that will only help you in a heated game of trivia. After all the exploring, we had built up a bit of an appetite. Or should I say a hankering for some tacos. With my parents visiting, we felt it was our obligation to introduce them to a local Texas taco chain, Torchy’s Tacos. While the tacos didn’t disappoint, the crowning glory of Tex-Mex in general and Torchy’s in particular is the Green Chile Queso. It is gloriously cheesy and seductively gooey. Against his will, my Dad was kind enough to share the liquid gold & chips even though he would have preferred to down it as soup with a large spoon. We finished off the day with naps, pool time at the hotel, and a lively game of cards. Hearts was the game of choice. Wednesday started a little later than Tuesday and with bad weather in the forecast. After another hotel breakfast where Russ was able to strategically dodge gluten, we headed toward Port Lavaca. While we wanted to do a little exploring in the Houston area, my parents also wanted to see the place we will call “home” for a year. So in their rental car, they also headed to Port Lavaca. We met back up later in the day to gave them an official unofficial tour of the town, including a cruise through our campground. We finished the evening with dinner at Shellfish in Port Lavaca. It was fish for everyone, tasty fish & chips for three of us and blackened fish for the gluten-intolerant one in our group (poor Russ)! Thursday meant it was back to work for Russ & I. We had invited my parents to come hang out at the campground. They spent nearly the entire day reading in the adirondack chairs facing the lake. They got to see our normal working routine and we spent our lunch hour over Greek salads poolside. After the work day, we headed to La Antigua for a little more Mexican. Queso was again ordered, but it didn’t stand a chance against Torchy’s high-standard. We returned back to the campground for another few hands of cards, this time it was two games of Euchre. Friday rolled around and my parents stopped by the campground to help us stuff Easter Eggs for the upcoming egg hunt we had planned at the park. They always seem to get roped into helping with tasks like this, but nothing will ever be worse then the time I asked them to help hot glue dried beans to popsicle sticks for a 2nd grade lesson on place value. My parents are the BEST! Before long, it was time for them to head back to Houston as they would be headed out on a flight early Saturday morning. We are so incredibly blessed they were able to come and visit us again as we traverse across the country. Thank you for the hours you spent planning, the money you spent spoiling us, and the time you spent traveling. You are so generous with all of those things and we couldn’t be more thankful. Where do you request we travel next? Dad I know you would say the Caribbean, we just need you to figure out how to get Charlie there!! Oct 7 Baseball, Coffee & the Beach . . . OH MY!